New research has identified areas of the Earth that are high priorities for conservation in the face of climate change. Europe is particularly vulnerable, as it has the lowest fraction of its land area, only four per cent, of any continent in ‘refugia’ – areas of biological diversity that support many species where natural environmental conditions remain relatively constant during times of great environmental change. The refugia that do exist in Europe are mostly in Scandinavia and Scotland. The biggest refugia are in the Amazon, the Congo basin, the boreal forests of Russia, the Artic and the Australian outback. The study identifies such climate change refugia based on the amount of natural habitat present and the risk that regions shift to a different type of natural vegetation due to climate change – a phenomenon known as ‘biome shift’. The research was led by University of Southampton biologist Dr Felix Eigenbrod working in collaboration with Dr Patrick Gonzalez, Climate Change Scientist at the U.S. National Park Service, and two other Southampton scientists – Dr Jadu Dash and Dr Ilse Steyl. They found that 10 to 28 per cent of the world is located in potential refugia or areas less vulnerable to future climate change and biome shift. In addition, only one to two per cent of the world’s vegetated area, however, is classified as refugia and protected by a national park or other protected area. The results suggest that, in regions where relatively large, intact wilderness areas remain (for example, Africa, Australia and South America), conservation of the remaining large-scale refugia is the priority. In human-dominated landscapes, (most of Europe, much of North America and Southeast Asia), focusing on finer scale refugia is a priority because large-scale wilderness refugia simply no longer exist. 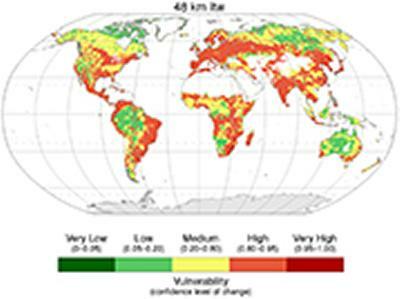 The findings, published in the journal Global Change Biology, are based on spatial and statistical analyses of historical climate data, satellite data on current vegetation, and projections of potential vegetation under climate change. Past field research has shown that human climate change has already shifted vegetation at the biome level upslope and towards the Poles or the Equator. A biome is the highest level of ecological system – rainforests, woodlands, grasslands, temperate forest, alpine and tundra – so a change in climate that can shift the location of a biome is a very substantial force. When a biome shifts, plants and wildlife that cannot cope may shift or disappear locally. When a road, town, or clear-cutting then destroys parts of the natural habitat, the ecosystem becomes even more vulnerable.